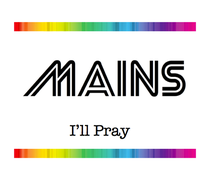 Amsterdam's newest synth-pop band, Mains, recently announced their debut single, ‘I’ll Pray’. Mains is a mysterious collaborative project of two Dutch producers who apparently were once a massive European act that had golden record sales and did world tours, including countless major festivals such as Glastonbury, SXSW, and more. Drawing inspiration from the music of the early-80s, this duo is now reinventing themselves by utilising vintage synths, microphones, and effects machines for a nostalgic, modern electronic music sound. On ‘I’ll Pray’, they combine vocals, a melodic blend of synths, and four-on-the-floor rhythms to form an infectious crossover original. As they cut through the clutter with their sound, they may stir up excitement in the music community with more catchy songs to come.